We invite you to join the Beavercreek Rotary Club Friday, February 1st for our weekly meeting. You'll enjoy lunch, conversation with other folks who are doing good in the community, and an informative and inspiring speaker. 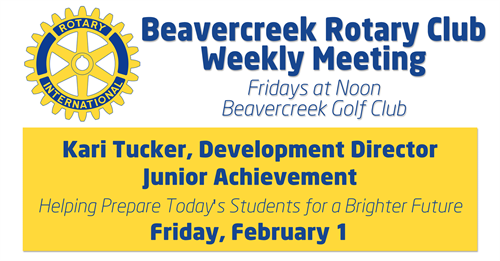 On Friday, February 1st, we welcome fellow Beavercreek Rotarian and Director of Development for Junior Achievement, Kari Tucker, with a presentation on how Junior Achievement of OKI Partners - Cincinnati/NKY is helping to prepare today's students for a brighter future.